Colorado’s marijuana legalization is quickly turning the state into one of the most prosperous places in the country. Not only has Colorado projected marijuana sales to be a billion dollar industry, but in January of 2014 alone, the state pulled in over $3.5 million in tax revenue from legal pot sales. If that trend continues, the state will enjoy an additional $40 million in tax revenue in the first year of legalization. But that’s not all – you know those dismal unemployment figures plaguing the nation? Not in states where pot is legal. 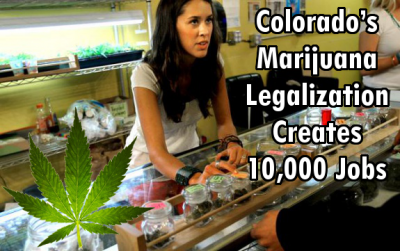 Colorado is reporting 10,000 new jobs, all from the legalization of both recreational and medical marijuana. A recent report by the Marijuana Industry Group indicates that since January, the state’s new-found recreational pot trade has created upwards of 10,000 new jobs, with 2,000 joining the green collar workforce just in the past few months – this doesn’t include jobs created by medical marijuana sales. The state is now enjoying one of the lowest unemployment rates in the nation – 6% – which is the lowest it has been since the recession started. So much for those old sayings about pot-heads being lazy. That’s an additional 10,000 people in a labor force out working, instead of collecting unemployment. That’s good for everyone. What’s more – the marijuana industry only makes up 0.4 percent of Colorado’s 2.6 million jobs; all of the positions are new and did not exist a year ago. This means that legalization basically created an economy out of thin air. And even more enticing is this little fact – many of the jobs are paying higher than the national minimum wage. Bud trimmers, for example, are being paid $15 an hour, while protestors have had to picket at McDonald’s headquarters because the company doesn’t want to raise their minimum pay to that amount. I’d say medicinal weed and hemp are far better for our economy than McD’s fries anyway.